ROSSBURG — Father’s Day naturally honors fathers and that’s what Ron Stump has done for his own dad, the late Clarence Stump. 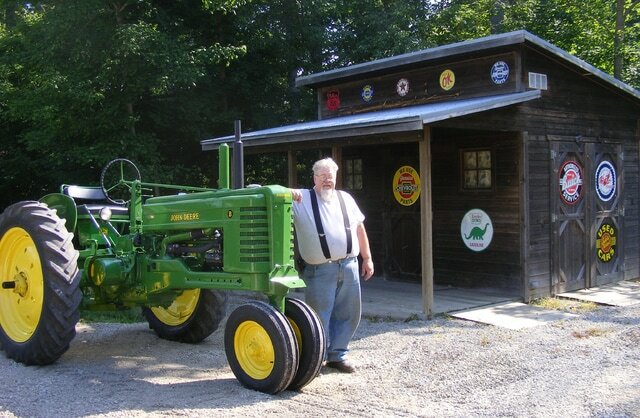 Ron, a mechanic, recently finished restoring his father’s John Deere tractor and just knows his father would be proud since the vehicle was his father’s pride and joy. According to Ron, the tractor hadn’t run for 30 years, but he bought it at the estate sale for $1,300. Ron said his father had two other tractors which they changed over to 12-volt systems from six volts. Ron said he has three times as much in the tractor as he paid for it at auction. “It doesn’t make any difference, it’s my dad,” he said. Ron worked with his father on an 80-acre farm in the Lightsville/Rose Hill Area. After his father retired from farming, he rented his farm out. “Everything had his mark on it, even the buildings on the farm,” Ron said. Ron suggested to his father that he sell the farm and move to town after his mother, Pearl, died on Jan. 22, 2004. His father died on Sept. 16 2008. The Stumps sold one tractor before Clarence’s passing and Ron bought the other two at the sale. At the estate sale, which was held April 25, 2000, Ron said he was bound and determined he was going to buy the tractor. Ron, who turned 60 on March 26, won out, and started working on it little by little since September 2010. Wife Bev is pretty supportive of her husband, even though he spends a lot of time in his work just as she does. “She says, ‘You’re all the time tinkering with that thing’, and I say, ‘It’s a toy. It’s my dad’s’,” he said. Ron plans to have the tractor at York Woods during the Darke County Steam Threshers Reunion and, of course, at the Portland tractor show which is featuring John Deeres this year. He’s not sure if it is going to be featured in the Ansonia Fourth of July parade this year, but does know that he is hauling the grand marshals through the parade in his bright red, 1966 Impala convertible. He took the Versailles Health Care King and Queen through the parade last Saturday during the Poultry Days parade. Working on the tractor was not an issue for Ron, who graduated from Mississinawa Valley High School in 1974. Ron is already contemplating whether or not to redo the Case tractor. He knows one thing. “It’s definitely not for sale,” he said adamantly. Ron is now semi-retired and said he picks and chooses what he does now. His mother, too, was a special parent.